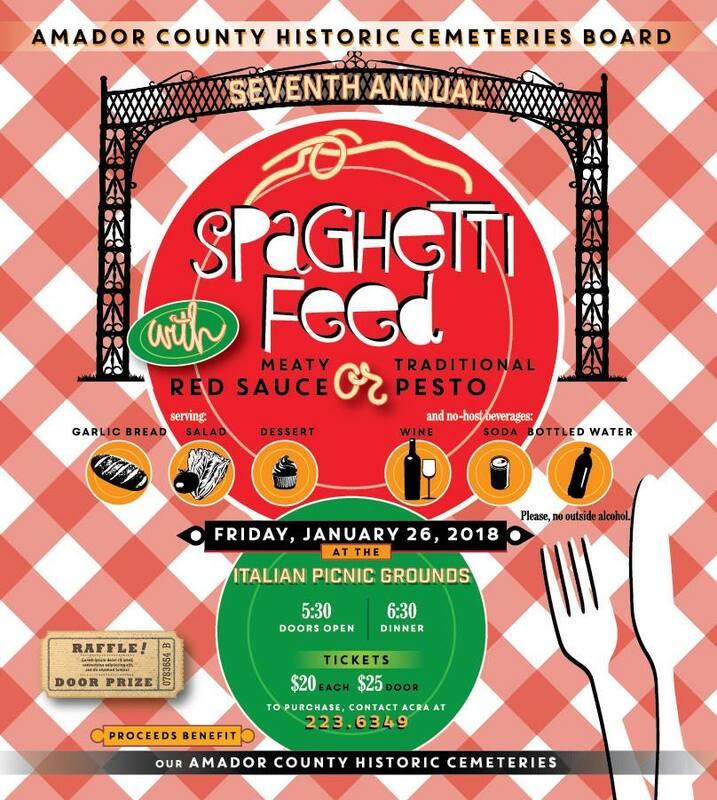 Come to the Amador County Historic Cemeteries Board's 7th Annual Spaghetti Feed on Friday, January 26 at the Italian Picnic Grounds! 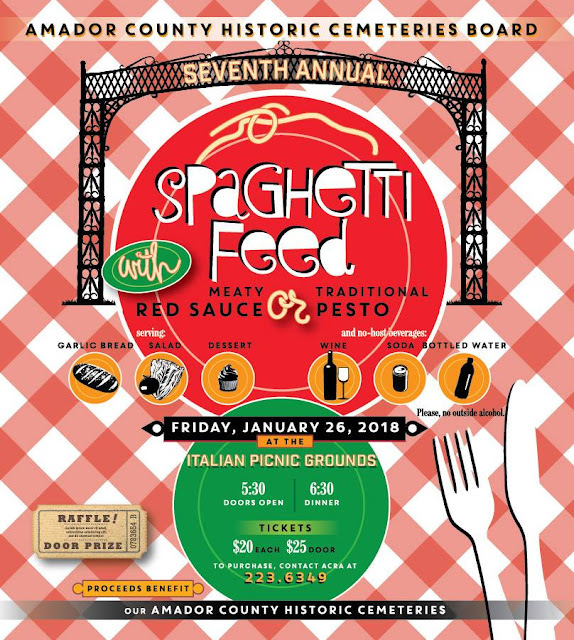 Enjoy a delicious Italian dinner of salad, garlic bread, spaghetti with a hearty red meat sauce, spaghetti with a green pesto sauce, and dessert! Wine, soft drinks, and water will be available for purchase. Please no outside alcohol. 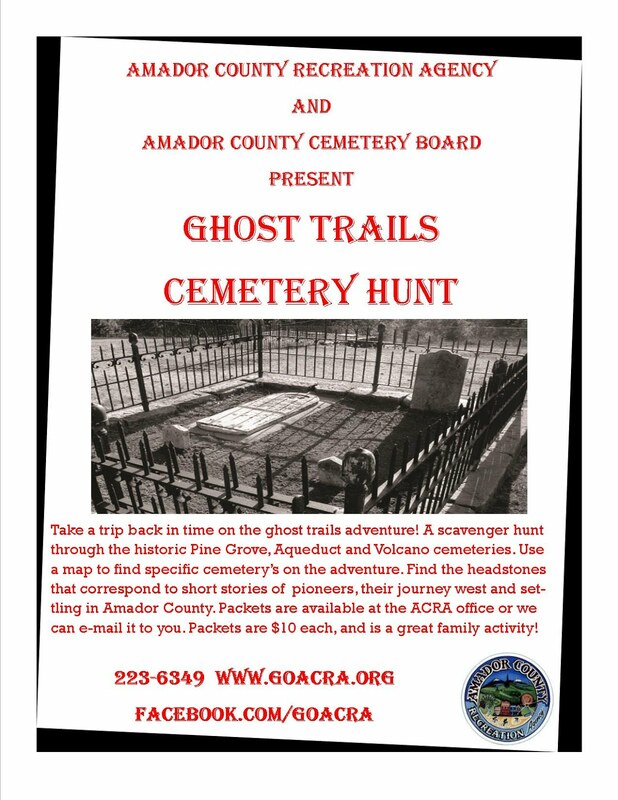 All proceeds go the preservation and protection of our historic Amador County cemeteries. To purchase tickets, contact ACRA at 209-223-6349, or come into the ACRA office at 10877 Conductor Blvd, Ste. 100, in Sutter Creek. $20/ person, $25 at the door. 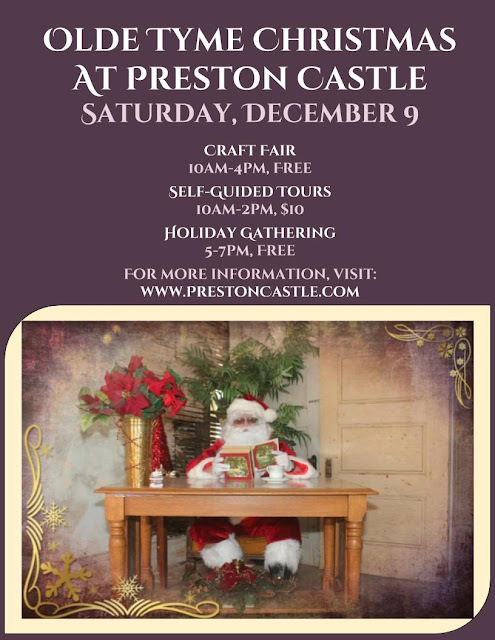 IONE, CA: Travel back to olden times at the beautiful Preston Castle on Saturday, December 9 from 10 am to 4 pm, and find holiday decorations and vendors with lots of interesting arts, crafts, jewelry, baked goods, and other gift items. This is a great place to take care of much of your holiday gift list. Most of the vendors will be indoors in the basement area of the Castle. Santa will be available for your wish lists and photos, starting at Noon. You may take a self-guided tour of the historic Preston Castle, 10 am to 2 pm, $10. On Saturday night, you can view the outside of the Castle lit up in Holiday Lights, from 5 pm to 7 pm. The Mission of the Preston Castle Foundation is to preserve, rehabilitate, and utilize the historic Preston Castle site. We are proud of the fact that the State of California has deeded the title for the Castle, four other buildings, and surrounding 13 acres of land, to the Preston Castle Foundation. This year we are working hard to complete the installation of new gutters and downspouts on the Annex portion of the Castle. To help raise money for this and other important projects, the Foundation sponsors several fund raising events throughout the year. Olde Tyme Christmas is the last event of 2017 for the Preston Castle Foundation, and our wonderful hard working volunteers will be taking a well-earned winter break. Things start up again with the first public tour day on April 7, 2018. Check our website and Facebook page for up to date information. Autumn is the perfect time to enjoy the colorful fall foliage and a hearty morning meal out in the country. 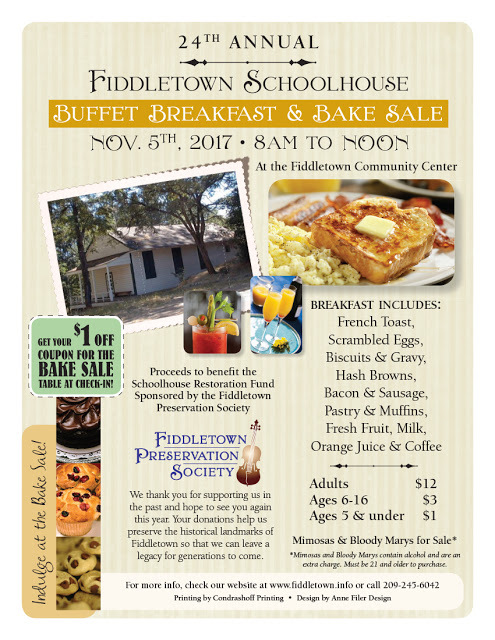 You are invited to attend the Fiddletown Preservation Society's all-you-can-eat breakfast buffet and bake sale on Sunday, November 5th, 2017 from 8 a.m. to 12 noon at the Fiddletown Community Center at 14445 Fiddletown Rd, Fiddletown, CA. All proceeds benefit the continued preservation of the original one-room Fiddletown Schoolhouse on American Flat Road. The structure was built in 1862, and served children in grades 1 through 8 until 1955 when the school closed and students began attending school in the town of Plymouth six miles away. The FPS began restoration efforts in 1964. The renovations are now complete. The schoolhouse is currently available to serve as a community learning & cultural center for small concerts, art and historical exhibits, and other public and private events. The Schoolhouse will be open during the hours of the breakfast for visitors. Prices for the breakfast are $12 for adults, $3 for ages 6 to 16 and $1 for ages 5 and under. The menu includes: French toast, scrambled eggs, hash browns, biscuits and gravy, bacon and sausage, pastry and muffins, fresh fruit, milk, orange juice, coffee & tea. A separate bake sale will also be available for guests to take home a piece of Fiddletown country goodness. Additionally, the Fiddletown Preservation Society will have items of local interest for sale, including the booklet Fiddletown Schoolhouse Memories, which is based on interviews with former students of the Fiddletown/Oleta School conducted by historian Elaine Zorbas. IONE, CA: On the top of the hill just behind downtown Ione rests Preston Castle – one of the last few remaining buildings of California’s first reform school for wayward juveniles known as the Preston School of Industry. Opened in 1894 and decommissioned in 1960, this dramatic building is a haunting reminder of the past. And haunted it surely is, as countless investigators and visitors have come to find out. But in October we focus on a different kind of haunting as numerous volunteers work hard to transform the castle into the Gold Country’s premiere haunted attraction, the Preston Castle Haunt. This exciting event is the Preston Castle Foundation’s largest and most anticipated fundraiser of the year, and all proceeds raised from this event go towards maintaining and restoring the building and surrounding property. Started in 2010 almost on a whim, the Halloween Haunt (as it was called back then) was created and operated by just a handful of volunteers. Taking advantage of the inherent spooky atmosphere of the Castle and using borrowed Halloween decorations and costumes, visitors were escorted in groups through the dark hallways and rooms in a small portion of the castle. 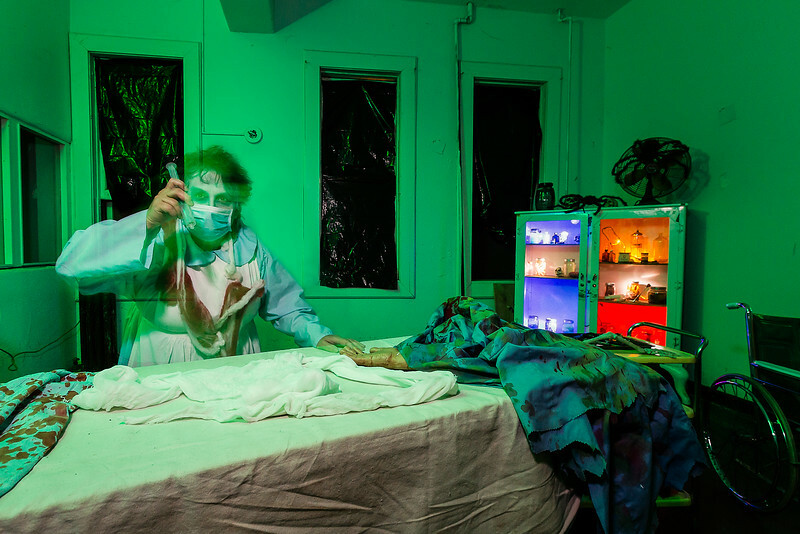 Guests encountered all manner of scary (and sometimes silly) scenes, from witches and werewolves to clowns and mad scientists. 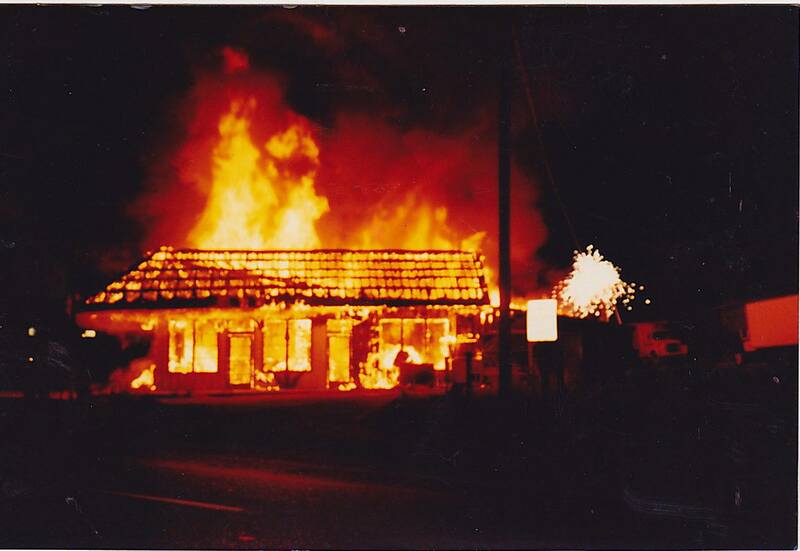 Over the next few years, the Haunt grew and became more popular. More hallways, rooms, and stairways were opened each year as the building was improved upon, and more and more talented volunteers joined the team of designers, builders, actors, costumers and makeup artists. 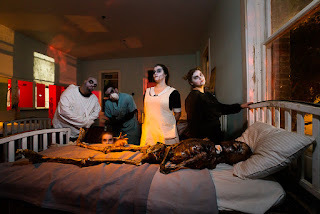 The theme of the haunt also became focused on the history of the facility, with costumes, set designs and music harkening back to the early 1900’s. 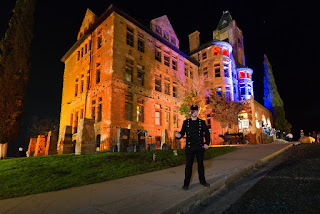 Preston Castle Haunt will be open from 7-11pm on October 13, 14, 20, 21, 27 and 28, rain or shine. Tickets are on sale now at www.prestoncastlehaunt.com ($25 general admission; $35 for VIP Fast Pass access with a shorter line) in limited quantities each night. NO tickets will be sold at the gate. Food vendors will be on site and Preston Castle merchandise will be on sale, weather permitting. 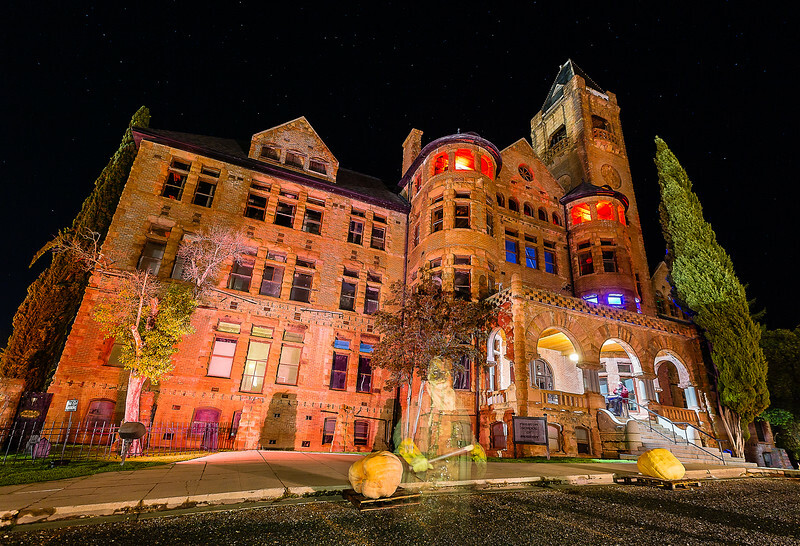 Your ticket purchases go directly towards maintaining and restoring Preston Castle, a registered non-profit 501(c)(3) organization, not into anyone’s pockets. Our Haunt is run entirely by volunteers. 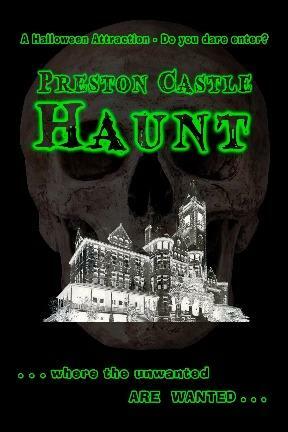 If you would like to volunteer for this year’s Preston Castle Haunt in almost any capacity, go to our “Preston Castle Haunt” Facebook page to find instructions on how to sign up. If you or your company would like to sponsor us with a monetary donation or supplies earmarked specifically for the Haunt, please contact us at prestoncastlehaunt@gmail.com. We look forward to scaring you this Halloween season at the Preston Castle Haunt! Come and see if you dare! Gates open at 6:45 pm, scare tours start at 7:00 pm. Admissions are limited for each night, so order early to make sure you can get in. If available, tickets may be purchased at the gate - cash or credit card only. No Refunds. The Mission of the Preston Castle Foundation is to preserve, rehabilitate, and utilize the historic Preston Castle site. We are proud of the fact that the State of California has deeded the title for the Castle, four other buildings, and surrounding 13 acres of land, to the Preston Castle Foundation. This year we are working hard to obtain our own water and sewer connections. To help raise money for this important project, the Foundation sponsors several fund raising events throughout the year. In addition to the Castle Haunt, we will be holding a holiday fair/bazaar called Old Tyme Christmas on December 10. Help Save the Castle and learn more about our history, events, and tours by visiting: www.prestoncastle.com. All contributions are tax deductible. 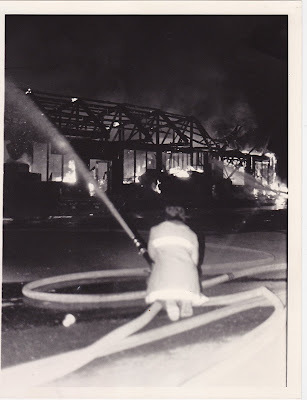 "We are working on some displays for the new Fire Museum and scanning and reprinting photos. 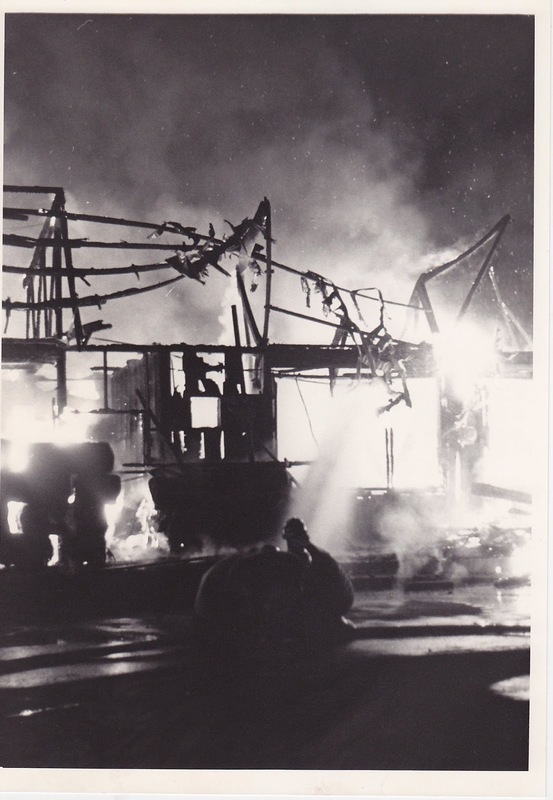 Here are a few from the Sierra Sea Food and Amador Feed Store fire at Sutter Hill on June 15th, 1986. This would be where Walgreens is today. Come and see us on the 23rd and 24th at Sutter Creek History Days!" 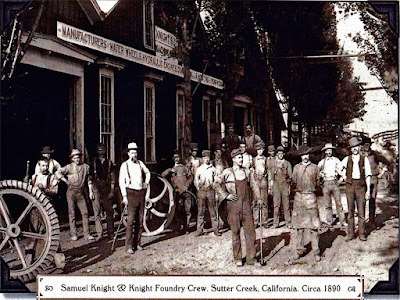 Take a stroll through Sutter Creek’s colorful past and celebrate its’ historic legacy. Come one, come all as we open the doors for you to visit the past and experience a bit of what it was like to live in Sutter Creek during the Gold Rush! 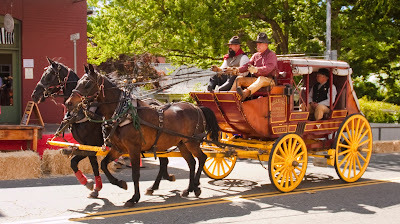 Try your hand at Gold Panning, take a ride on a real Stage Coach, hear historians tell stories of the past and visit Sutter Creeks’ amazing historical sites, some that are rarely open to the public. All this fun and it’s free too! On Sunday morning, start your day off with a family fun “Pancake Breakfast” at the new Sutter Creek Fire Station (350 Hanford Street) from 8am to 11am. Then finish seeing all the sites you missed on Saturday while exploring modern day Sutter Creek, too. Sutter Creek is known as the “Jewel of the Motherlode” because of the rich veins of gold that were discovered there. 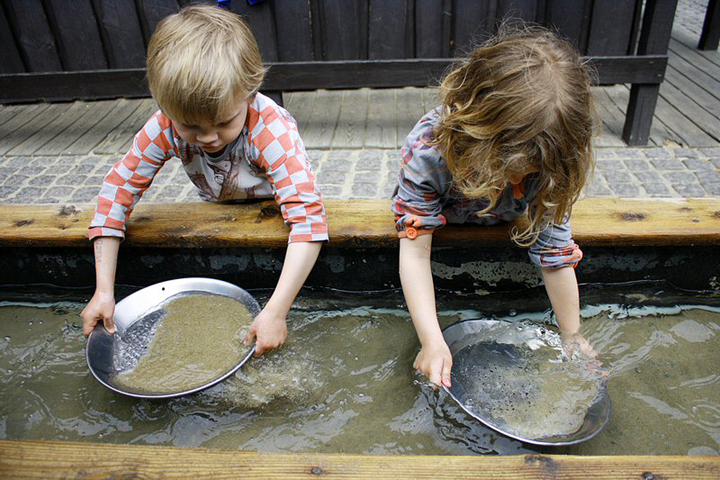 During the Gold Rush, thousands flocked there to make their fortune. Over $160 million dollars in gold ($5 Billion by current standards) was extracted from this region between 1851 and 1942. Self-Guided Tours: Maps will be available at all venues….pick one up and start having fun at any location! 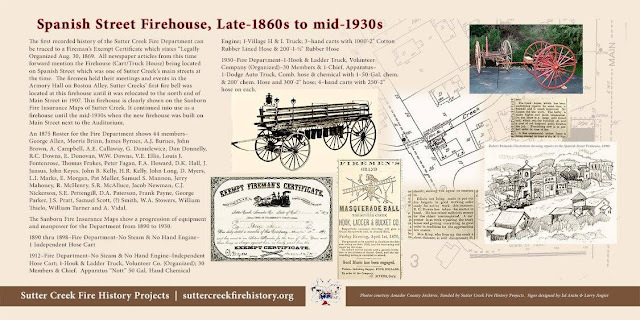 "Seldom Told Tales of Sutter Creek": Local Historian Frank Tortorich will do a FREE walking tour on Saturday at 10 am, limited to the first 20 people who arrive. Meet in front of the City Hall/Auditorium. It will last about an hour to an hour 1/2. Then he will also do a FREE presentation at 1 pm, Sat only, at the Sutter Creek Theater, called "49ers -- How They Got Here". Gold Panning and the Miners’ Bend Park: The earliest gold seekers worked the local creek and stream bed with simple gold pans. 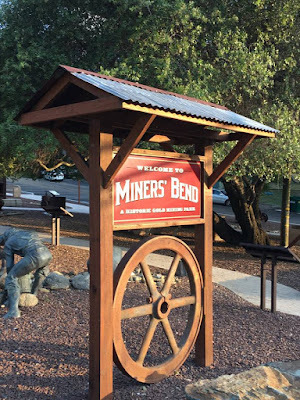 To celebrate those endeavors, at Miners’ Bend Historic Park, at the South end of town, there will be gold panning demonstrations and everything you need to try your hand at panning to see just how it was done. Then stroll through Miners’ Bend and learn the history of the mines at the south end of Sutter Creek. The early mines of this area are featured on the interpretive signs of the park. 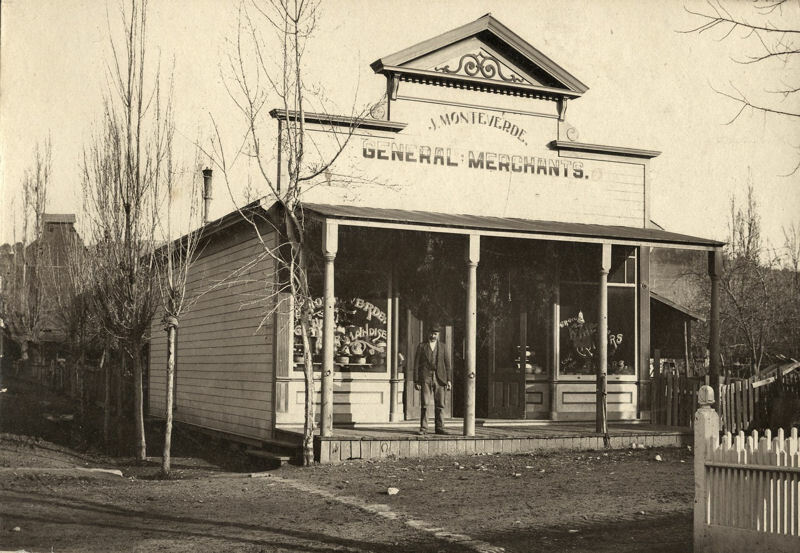 Stage Coach Rides and the Sutter Creek Visitor Center Museum: Stop by 71A Main Street and see the old photos and historic relics. 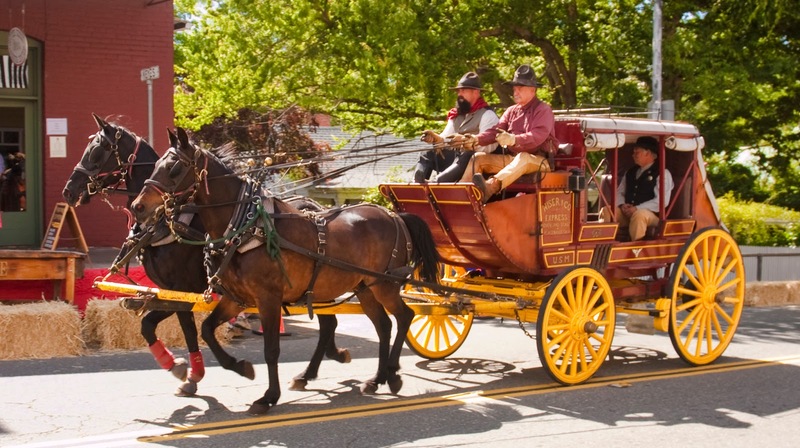 Then catch a free ride on an authentic stage coach, provided by “Doc” Wiser, from 12 – 3pm on Saturday. The Central Eureka Mine, up the hill from Miners’ Bend, will be on the map for you to visit as a representation of these famous mines. The Old Eureka Mine was first opened in 1852 and it was operated independently until 1924 when it merged with the Central Eureka Mine, the combined properties operated as the Central Eureka Mine, which is credited with producing $36 million dollars in gold! Hetty Green, the one-time richest woman in the world, was the owner of the Old Eureka Mine. 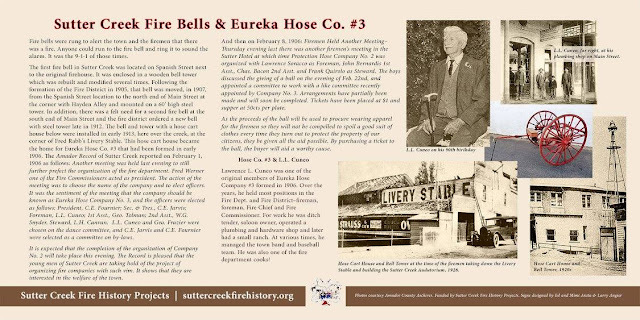 Sutter Creek’s Original Fire Departments: Sutter Creek’s old firehouse at 18 Main Street is now a Fire Museum and will be open to visitors. Sutter Creek’s first fire truck is being recreated here in a 1930’s auto workshop, along with the Firemen’s Meeting Hall and other displays. 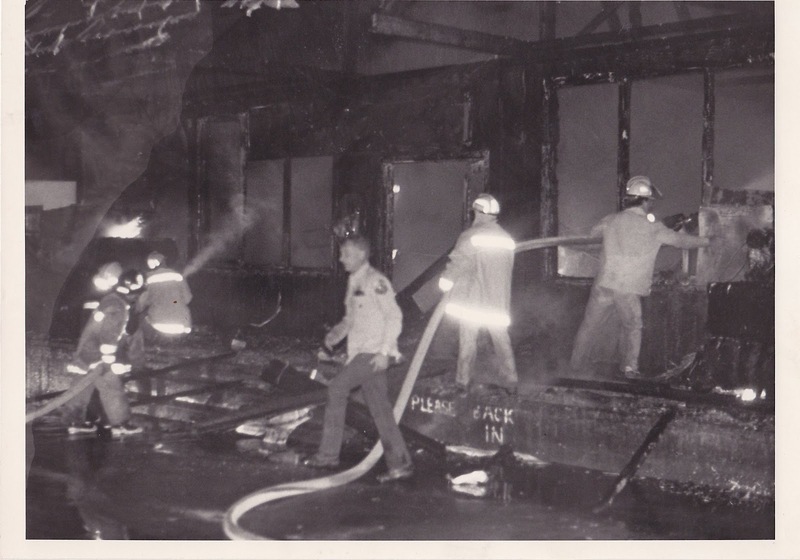 Fire History Volunteers will also be on site at Sutter Creek’s first fire house on Spanish Street and at the fire bell tower on Main Street at City Hall. 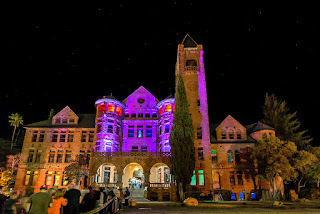 Sutter Creek Auditorium and City Hall: Located at 18 Main Street, this 89 year old building houses locally painted murals depicting Sutter Creek’s colorful history. Historic Methodist Church: At 14 Main Street, this beautiful church has all the charm of yesteryear, a sight to behold. The Knight Foundry: Located on Eureka Street, is the last remaining water run foundry in the county. It will be open with the machines running and historians on hand to give you an amazing insight to the production that went on there. Monteverde General Store museum: Which opened as a country store in 1896, still displays all the paraphernalia of the past on its shelves. 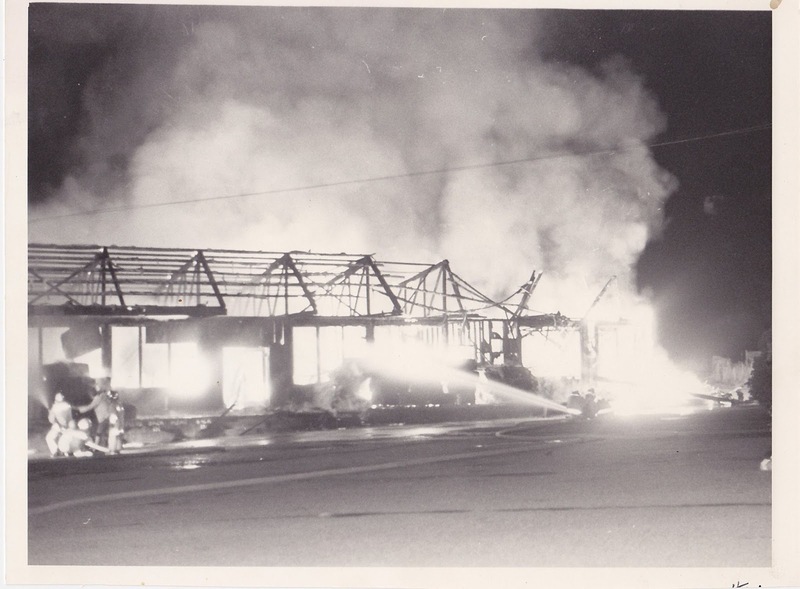 A local Historian will be there to tell you its’ history. Right next door is another treasure not to be missed, with floor to ceiling murals of the history of Sutter Creek, painted by local artist Rand Huggett. Sutter Creek Historic Grammar School: The large, two-story brick building served as a school from 1870 to 1964 and is the second oldest 2 story brick schoolhouse in California. 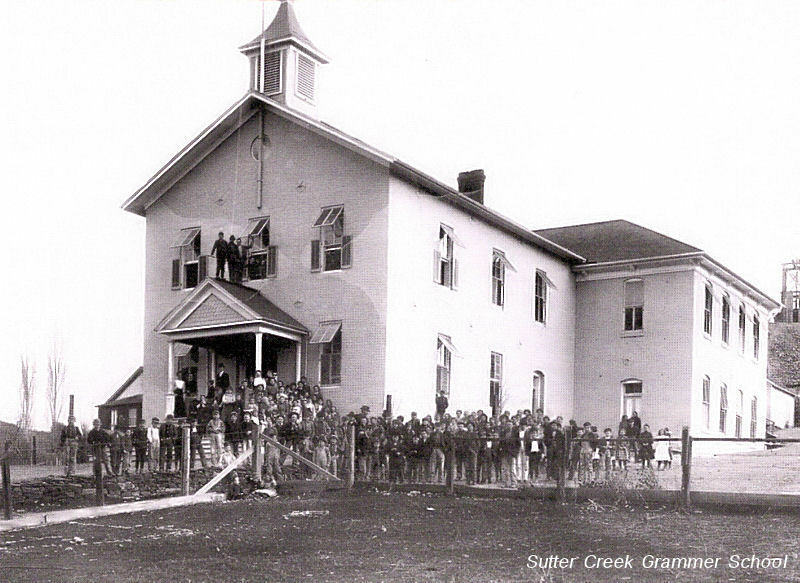 This beautiful schoolhouse is currently being restored by the Sutter Creek Community Benefit Foundation. Take a look at how much they have done and how beautiful it really is. Ghosts of the Past: Visit the Catholic Cemetery and the City Cemetery. Many locally famous families and settlers found their final resting place there. Sutter Creek Theater: A former silent film theater, which just turned 100 years old, will be open for you to see FREE movies. This beautiful theater has events every weekend with live music and now showing films too. 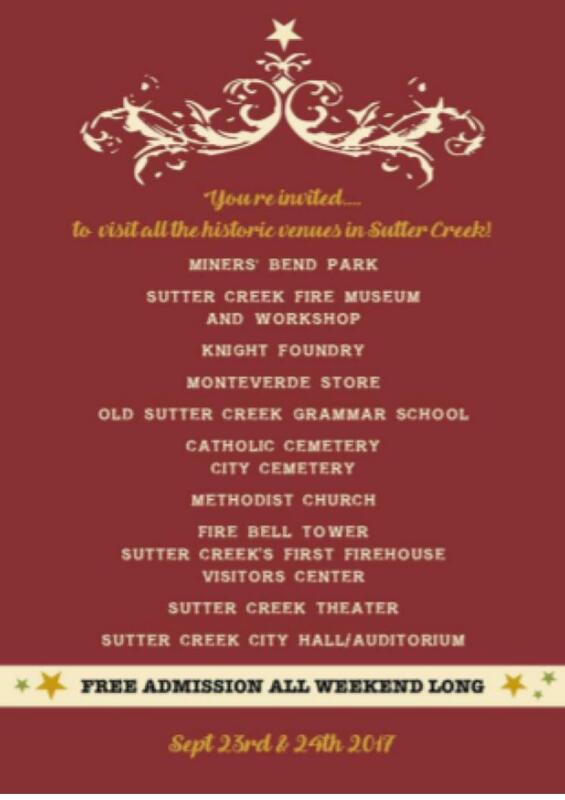 Please come join the Sutter Creek Community Benefit Foundation as we celebrate with ”Sutter Creek Heritage Days”! For more information call 209-560-6880 or visit sccbf.org. 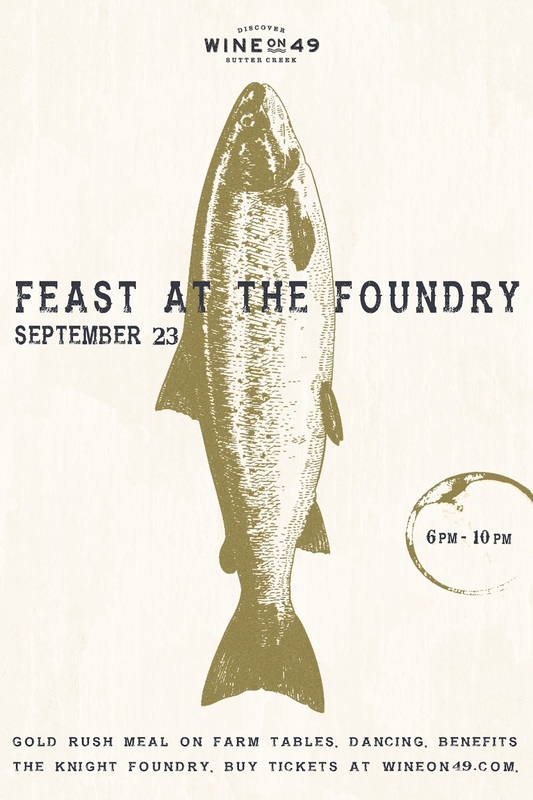 Feast at the Foundry - Saturday, September 23. Experience a Gold Rush meal along a row of locally handcrafted farm tables. Sip wine while staring in awe of the historic Knight Foundry. Dance the night away to Americana band Pine Street Ramblers. The dinner helps benefit restoration efforts for the Knight Foundry. The five course meal is inspired by the cuisine of the Gold Rush days, focusing on the provisions available at that time, and foraged locally now. After appetizers in the 'saloon', we'll sit down outside to three courses served family style. Botanical greens with local chevre and grilled figs, will be followed by wild salmon and coal roasted veggies, then on to a wood oven-roasted leg of lamb and open 'fired' chickens, served with greens and potatoes. Each course will be paired to the wines of Wine on 49. Local pies and ice cream will be provided later to keep your dancing shoes tapping. Tickets are $129 per person. Dinner will be from 6pm to 10pm. Ticket price includes dinner and dancing, and a Wine on 49 tasting certificate for all nine boutique tasting rooms in charming Sutter Creek on Sunday, September 24th. 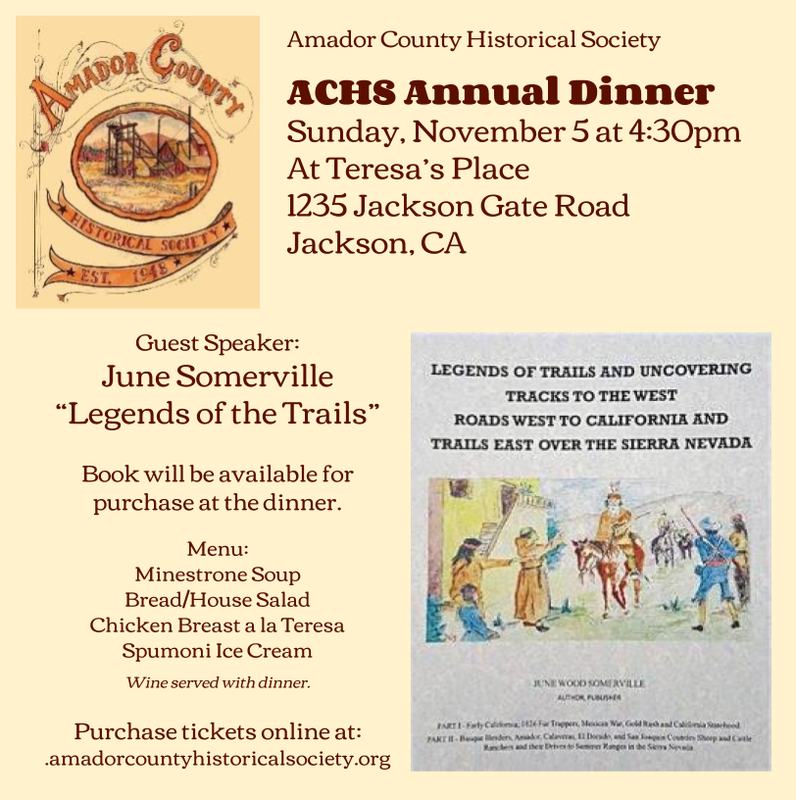 The dinner is part of Sutter Creek's Heritage Days, a weekend celebrating our town's unique history where you can stroll through our past and enjoy our present. Charred potatoes, paprika, rosemary olive oil. JACKSON, CA - Main Street Theatre Works is donating 50% of the net proceeds from their September 1st performance of The Crucible to the Kennedy Mine Foundation (KMF), to help with repairs from the fire on their property August 14th. The fire started in the Change House, with significant smoke and soot damage. Display cabinets and artifacts had to be taken down and cleaned; everything has to be removed, prior to a professional cleaning of the structure. It will take a great deal of work to recreate displays, but luckily the models and most of the artifacts will be okay after professional cleaning. 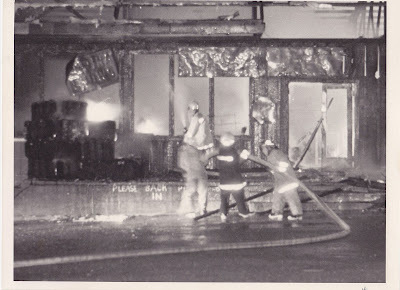 All of this takes many volunteer hours, as well as money for cleaning and rebuilding. 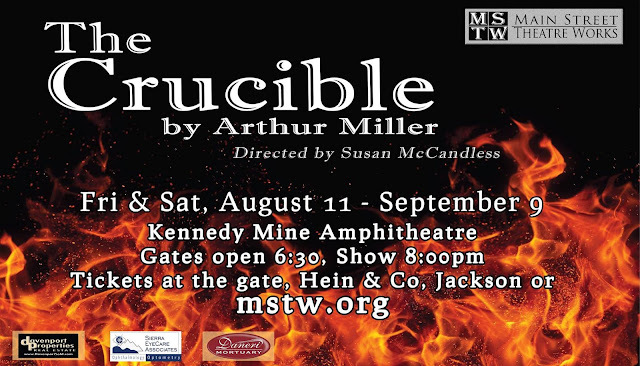 Main Street Theatre Works, who performs every summer at the Kennedy Mine Amphitheatre, wanted to find a way to help their partners at the Kennedy Mine Foundation, so the board decided that MSTW would donate 50% of their net ticket sales from the September 1 showing of The Crucible. 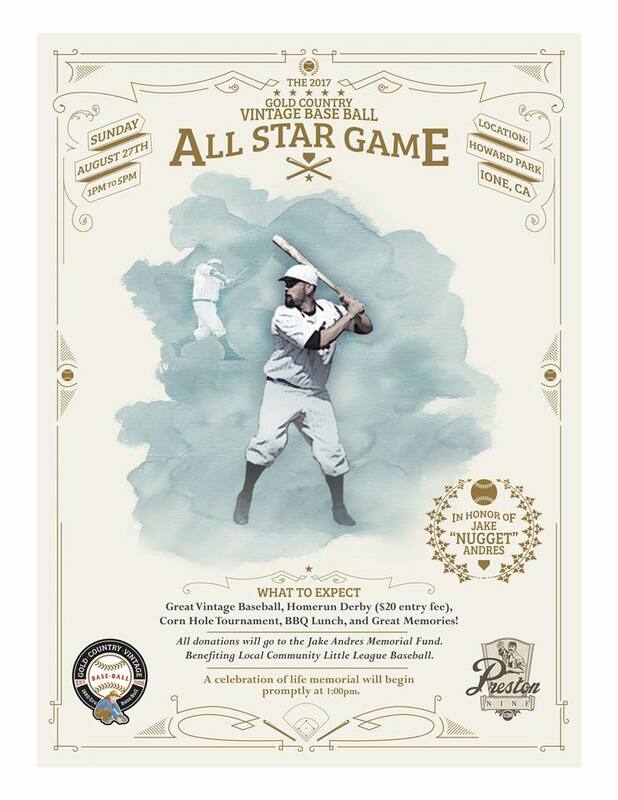 Tickets can be purchased on line at mstw.org, at Hein & Company on Main Street, Jackson, or at the gate. The gates open at 6:30 for picnics, show starts at 8pm. The Crucible is Arthur Miller’s explosive account of the famous Salem witch trials, and it remains one of his most enduring classics. It has the intensity of a thriller, but is also a cautionary tale of extremism that can lead to dangerous mass hysteria. The Crucible runs now through September 9, with the special KMF Fundraising performance Friday, September 1. Buy your tickets now and show your support. Main Street Theatre Works is a professionally oriented, non-profit theatre company, performing in the heart of Amador County. The setting for the show is truly spectacular. The amphitheatre is located on the Kennedy Mine property. Patrons walk past the newly repaired tailing wheel #1, across the old Main Street bridge, into a grass-covered, terraced bowl, surrounded by majestic oaks. There the stage is set for picnicking and enjoying professional quality productions. You are truly sitting on a gold mine, enjoying theatre under the stars. The Kennedy Mine Amphitheatre is located at 1127 N. Main Street in Jackson. KMF Fundraising performance Friday, September 1st. 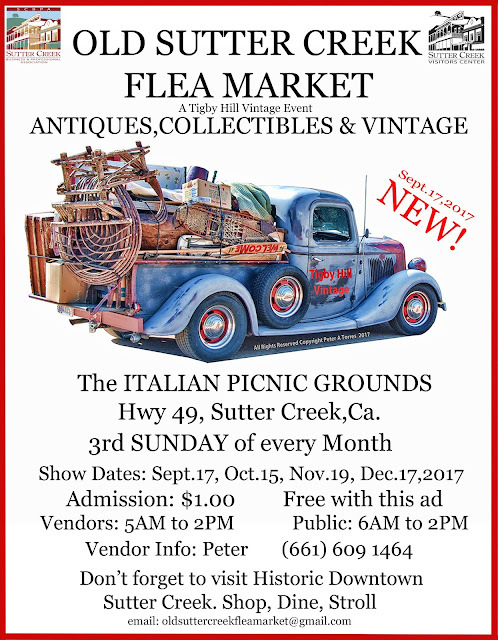 The Sutter Creek Community Benefit Foundation and the Sutter Creek Promotions group are planning a first-ever event for Sutter Creek on the weekend of September 23 & 24. 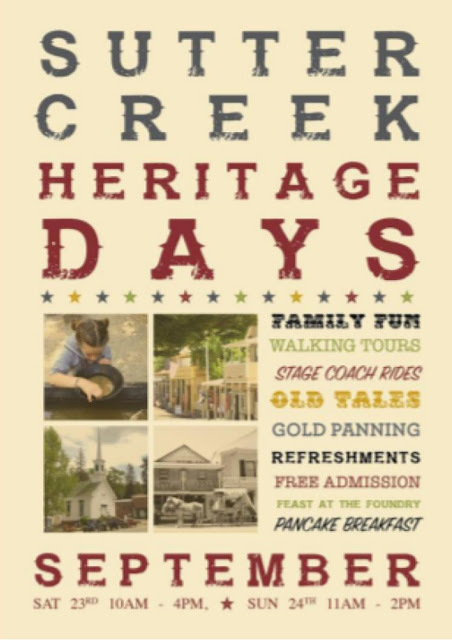 A variety of historic sites in Sutter Creek will be open and highlighted for this weekend. The Sutter Fire Department will be holding a pancake breakfast at the Main Station on Sunday morning the 24th. The Sutter Creek Fire Museum will be open, and we will also have displays and volunteers at the First Firehouse on Spanish Street and the Fire Bell Tower at the Auditorium/City Hall. We will eventually have interpretive signage at both Spanish Street Firehouse and the Fire Bell on Main Street, so I have developed signs and getting them produced now for use at the September event. Interpretive signage for Sutter Creek's first firehouse on Spanish Street. 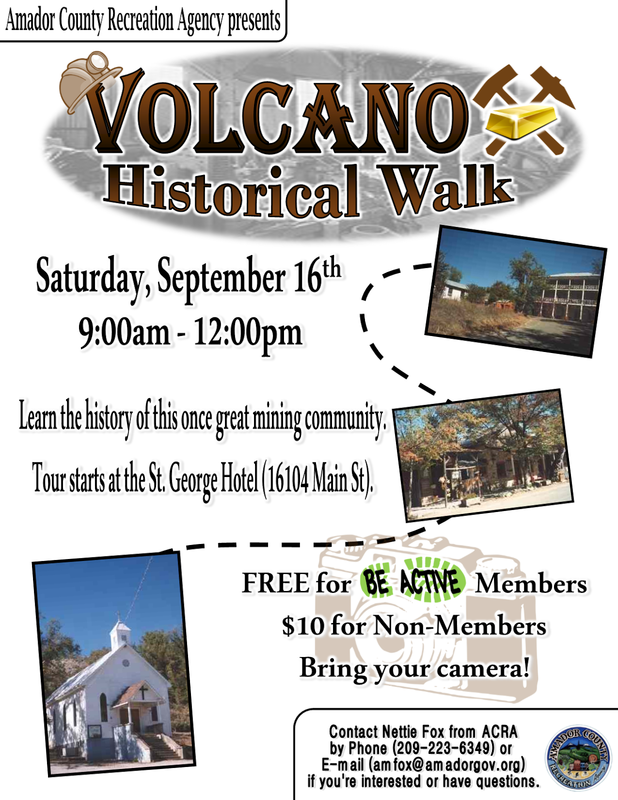 Learn the history of this once great mining community! 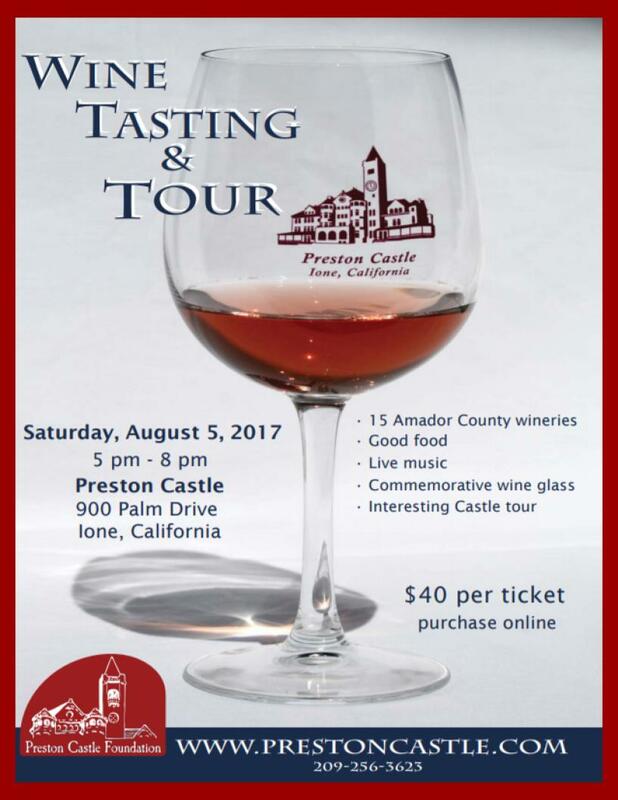 IONE, CA: Taste the fine wines of Amador County and enjoy the aura of the historic and majestic Preston Castle. Experience the history and feel the sensation of the past. Attendees will sample fine wines, poured by 15 different wineries, from commemorative Preston Castle wine glasses. Sip a glass of wine, enjoy a variety of foods, and listen to live music on the patio, and in Wine Cellar. The popular Midtown Jazz from Sacramento will be entertaining guests on the patio. Also, you will be able to take a self-guided tour of the public areas in the Castle, where docents will be on hand to answer your questions. 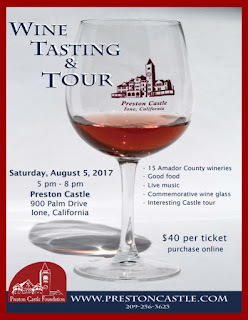 This is the 13th Annual Preston Castle Wine Tasting and Tour. 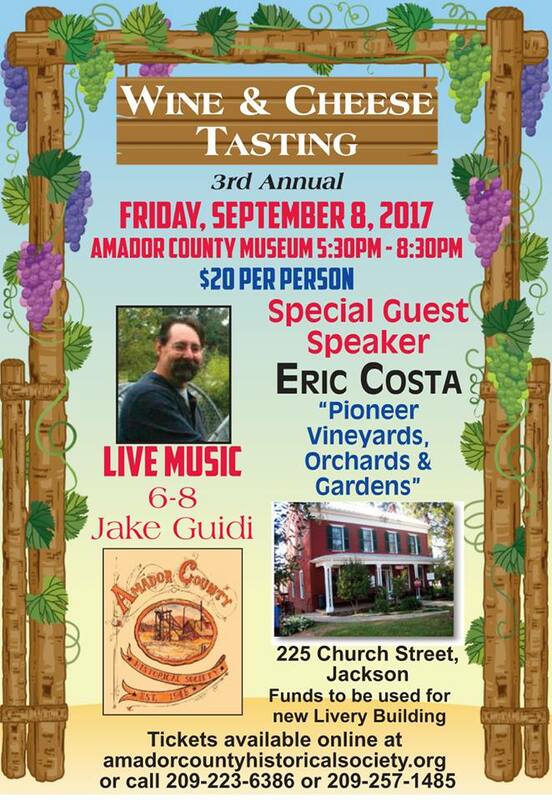 It continues to be one of Amador County's premier wine events, and is always a sellout, so get your tickets now! 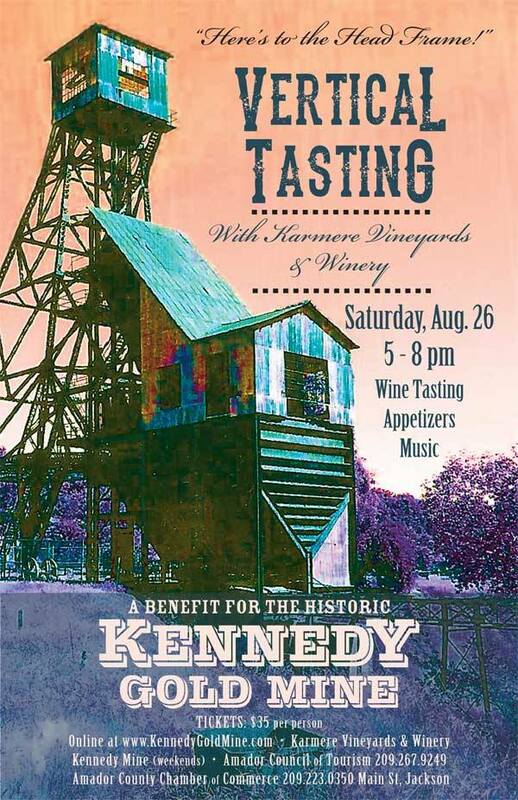 Amador Cellars, Bella Grace, Bray, Drytown, Karmere, Prospect Cellars, Scott Harvey, Sera Fina, Sobon, Story, Tanis, Terra d’Oro, Vino Noceto, Wine Tree Farm, and 24 Brix. The Mission of the Preston Castle Foundation is to preserve, rehabilitate, and utilize the historic Preston Castle site. We are proud of the fact that the State of California has deeded the title for the Castle, four other buildings, and surrounding 13 acres of land, to the Preston Castle Foundation. This year we are working hard to repair and replace the aging gutters and downspouts on the Annex portion of the Castle. To help raise money for this important project, the Foundation sponsors several fund raising events throughout the year. In addition to the upcoming Wine Tasting and Tour on August 5, we will hold the exciting ParaCon on August 25th and 26th, a Photographer’s Day on August 27, the scary and spooky Preston Castle Haunt the three weekends prior to Halloween, Oct. 13, 14, 20, 21, 27 and 28, and a holiday fair/bazaar called Olde Tyme Christmas on December 9.